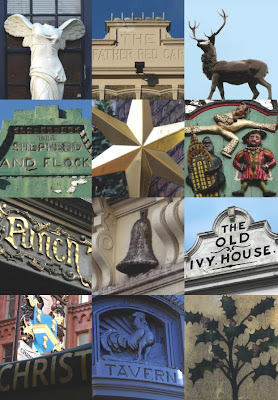 Here's my 12 loosely-themed (London) pubs of Christmas, 2008. If you can recognise any of them then please do get in touch with me at the address above left. Eat, drink and get merry! If anyone would like to buy some of these Christmas cards, then please do get in touch. Inside reads, Eat, drink and get merry.